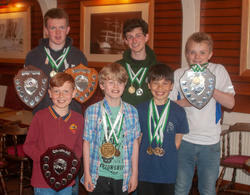 Lerwcik Boating Club proved a great venue for our annual prize giving night. Thanks to for eveyone who came along, donated food and raffle prizes. Max wins the combined, Master of Arms Trophy. There are 2 very important Shields awarded each year, and these have been presented for many years, from when the Club began. These are the 'Best Improver' Award and the 'Style Award' THis year, there were several good candidates, but the awards were made to 2 of our youngest fencers. The Style Award is given to a fencer who shows good technique and style, and also shows a good sporting attutude all round. This award was made to Koll McConnachie, 8.